Henri Dorra, in his comprehensive new book, presents the development and the aesthetic theories of the symbolist movement in art and literature. Included are writings (many never before translated or reprinted) by artists, designers, architects, and critics, along with Dorra's learned commentary. Fifty photographs of symbolist works complement his encyclopedic coverage. Dorra traces symbolism and its roots from artist to artist and critic to critic from the 1860s to the early twentieth century. The decorative arts and architecture are examined as well as painting and sculpture. The Arts and Crafts movement, art nouveau, the work of Eiffel in France and Sullivan in the United States are all well represented. 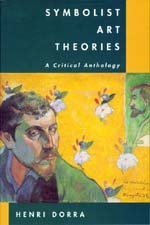 The close relations between symbolist poets and artists are reflected in the chapter on literary developments. Baudelaire, Rimbaud, Verlaine, and Mallarmé are here, but so, too, are writers less well-known. A section on the Post-Impressionists and the "Artists of the Soul" rounds out Dorra's rich and varied text, and his epilogue lays the groundwork for what was to follow symbolism. Dorra beautifully integrates the different aesthetic branches of symbolism, the different media and national variations, without ever losing sight of the whole. The historical context provided makes this a particularly appealing collection for students and scholars of art history and literature, as well as for anyone interested in the evolution of symbolism. Henri Dorra is Professor Emeritus of Art History at the University of California, Santa Barbara, and the author of numerous books and articles on art and art criticism.